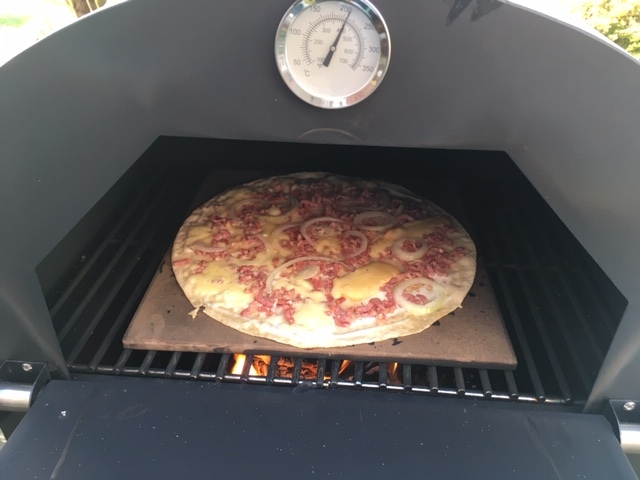 I have to say the pizza oven I tested the other month makes a cracking Tarte Flambee, and I am starting to get addicted. I was in the Alsace region of France where they are famous for their Tarte Flambee’s and brought the ingredients home with me. Basically, I brought several packs of thin bases, fromage blanc, lardons, Munster cheese and some grated gruyere & mozzarella cheese. I had 11 members of the family over for bonfire night, and at lunch time decided to cook them each a Tarte Flambee. OK you are thinking that is a lot of work, but actually it wasn’t. They are so easy to make and cook, with results no different to what you get in a restaurant. To make the Tarte Flambee I took out a base and spread a layer of fromage blanc, but you can use crème fraiche as well. Next, I put on some finely sliced onions which I had soaked in ice water to reduce the harsh flavour. Note I dried the onions before putting on the base. This was followed by a small amount of lardons which I had quickly flash fried to remove excess oil. 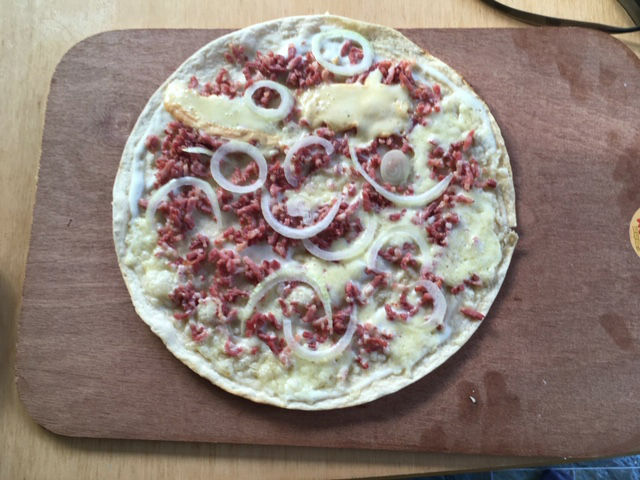 I didn’t want a soggy Tarte Flambee, also go easy on the lardons as it can make it too salty. Now that is it for a classic Tarte Flambee, so I put it in the oven to cook. Should point out that I had lit the oven 15 minutes earlier with a few pieces of wood. This gave me time to get my ingredients out into the garden and get myself setup to start cooking. I then made my next Tarte Flambee, and once complete the first one was cooked. A quick switch, and I started on the next one. I then had myself a nice production line and was knocking out Tarte Flambee’s every 2 minutes. Subsequent ones varied depending on people’s choice. The Munster went down well, as did a mushroom one for our veggie. And just when my guests thought they couldn’t eat anymore I started knocking out ones with Nutella spread and Maltesers. Yeah Baby! I still had lots of ingredients including bases left over, so I had them again the following week. This is so easy to do as the oven takes no time to get up to heat, making them is a breeze, and they cook in minutes. I should point that these photos are not from when I had the big cook, but from me using up the spare ingredients last week. I am saying this as these Tarte Flambee’s were not as good. First, I used too many lardons, so it became a bit salty. Second the onions are too thick and should be a lot thinner. Don’t get me wrong these Tarte Flambees were still very tasty, but if you want perfection, less is more.